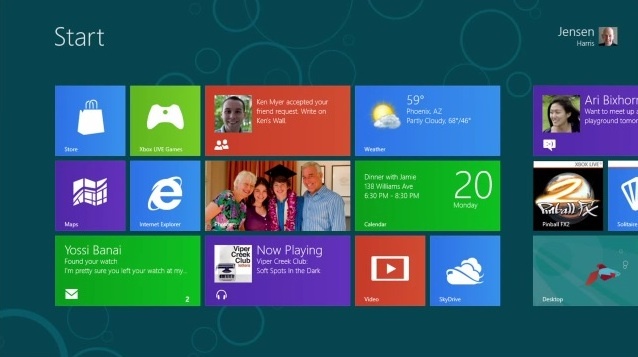 Microsoft released Windows 8 Consumer Preview today, a pre-release version of their next generation operating system. Windows 8 incorporates the touch-centric Metro interface while still maintaining access to the standard Windows file system and desktop, effectively merging their tablet UI and desktop UI into a single operating system. This is obviously a different approach than Apple took while keeping separate iOS and OS X, but nonetheless Microsoft is bent on this strategy to compete with Apple’s offerings and the wildly successful iPad. If you have hardware that meets the requirements (you probably do), download an ISO and start installing, the links below point directly to Microsoft servers. Don’t want to bother with downloading and installing a beta OS that you may not spend much time on? Check out the two videos below to see Windows 8 in action instead. Has MS set a price on it yet. I would be interested in a Metro-only tablet with some Xbox integration, I like the tile interface, but I have no interest in Windows as a desktop OS anymore. Too many viruses, spyware, crashes, too many problems. The Mac is a superior desktop OS with no crashes and problems, but the iPad to me feels like a toy still and it’s impossible to get serious work done on it other than reading and writing a few short emails. I suspect this is a limitation to tablets, but Microsoft is an office productivity company so if anyone can pull off a productive tablet it is them. What kind of serious application work are you looking to do on a tablet that you can’t do currently? Please keep in mind that when Steve Jobs introduced the iPad, it was presented as a 3rd platform option (along with desktops & laptops). Expecting a tablet to do SolidWorks design work is not what its intended for. In that same vein, what you may consider to be non-serious work could be opposite for another user (think salespeople). It’s all about workflow and finding what works best for you. There are plenty of “productivity” apps for tablets/iPads. A handful of fairly good Office Suites, robust notetaking tools like Evernote, file-storage like Dropbox and multi-track recording suites like GarageBand. There are serious enterprise Apps like ArcGIS and AutoCad available for iPad,.. and also functional sketching/art tools like SketchBookPro and Photoshop. If you’re still feeling constrained,.. the iPad comes with native support for Cisco IPSEC VPN.. and there are a variety of remote-desktop apps like Mochasoft RDP or Logmein that will connect you to whatever Windows box you need access to. This whole mindset of “tablets are just light consumption devices” needs to die. It’s patently wrong. Please tell me the app I need to develop Ipad apps on the Ipad. How I run a virtual machine so i can run windows and develop .net apps. How I can convert a movie and burn it to a DVD. How I can install Oracle software such as sql developer to play around with some databases. What content can I create on a tablet, without remoting a machine that can create content, thats as easy or natural. For example has anyone tried using these apps to remote a device or to draw? Its painful and frustrating. Even if I’m running Mac, iPad and iPhone I have to say that this videos of the preview look very very good. Navigation using the keyboard and mouse feels awkward in Windows 8. If only they just got rid of the traditional desktop and their file manager isn’t at all touch optimized. Looks awesome. They’ve really done their work on this one and made design a priority. It’s the first time I could actually see myself using Windows again. Android, on the other-hand is a clusterf*ck of crap. I agree, Windows 8 Metro looks nice. No interest in the Windows desktop disaster, and am still waiting for Android to be unified for tablets although it’s not bad on phones. WebOS was promising but it died a quick death. iOS remains king of tablets and Mac OS X king of desktop productivity. Given Apple’s “Vista” (ie. Lion), this might be worth a look. I found that to do the install of the 64-bit version, I had to reboot my machine (MacBook Pro, Snow Leopard) into a 64-bit kernel by holding down 6 and 4 keys while booting. The way to tell whether it’s running a 64-bit kernel is to run Software Profiler (About This Mac / More Info) and select Software. It will say 64-bit Kernel and Extensions: Yes if and only if running a 64-bit kernel. Does the consumer preview come with anti-virus? Hi I am writing you a super group of excellent singers and listen to you the great experience you beautiful voices blend together and once I had a chance to ever go to America and meet with you would be my one big dream is to meet you again and if no I could be with you even play so I could fill my dream. I do not know when to return to Europe but feel that some but not nearly so perhaps sometimes even more so but me and if you ever manage to visit America, and certainly I would be happy if we have your performances on the inactive ever have seen. I wish you all the best for the whole group every success and delivers excellent performances especially great in your administration. Again I wish all the best for a nice day.